Hi there. 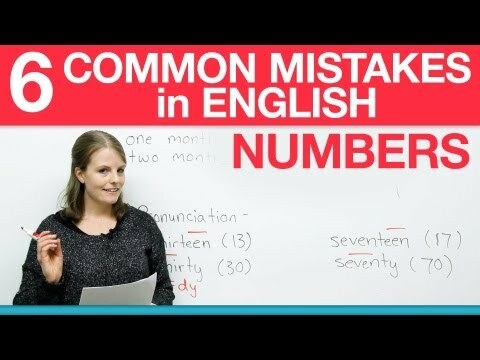 My name is Emma, and today we are going to look at common mistakes that ESL students make when they're talking about numbers. Okay? So in this video, we will look at five different mistakes I hear my students make often and ways to correct these mistakes. So let's get started. First we're going to look at pronunciation, the pronunciation of numbers. Okay, so the first mistake I hear often is when students are talking about time -- or things in general, but often with time -- they're talking about the month, the week, the night, the year, the day; they often forget to pronounce the "s" or they pronounce an "s" when they shouldn't. So what do I mean by this? Well, first I have "one month", "two months". So notice in this case: there's no "s" so I don't pronounce an "s". In this case there is an "s" so I do pronounce an "s". So even though it's a pretty simple rule, a lot of people when they speak, they don't do this. I hear students say all the time: "I've been here for one years." Or "I lived there for five year." Okay? So be very careful when you say numbers, make sure that the noun that comes after, if there's more than one: you need an "s" and it's pronounced, the "s" is pronounced. "nights". Okay? Whereas "year" and "day", when we add an "s", the "s" is pronounced like a "z". "Years", "days". Okay? So keep that in mind. Okay, so the first sentence. Listen carefully to see if I pronounce the "s" after the number or not. "I've been here for one years." Is that a correct sentence? No, it's not because I said "one", it should have been: "I've been here for one year." Okay, number two: "Four day ago I saw my aunt." So what's wrong with this? Is there anything wrong? "Four day ago I saw my aunt." It should be: "Four days ago". There're four of them so they need to be plural, so you need to pronounce the "s". Next one: "I've worked for two months." Is there a problem with that? "I've worked for two months." No, that sentence is okay. I pronounced the "s" because there were two months. Okay, number four: "I must study for five month." "I must study for five month." Did you hear an "s"? So that one was incorrect. It should be: "I must study for five months." Last one: "I went to Cuba for one weeks." What's the problem with this sentence? I pronounced an "s" after "week", but because there's only one, it shouldn't be "one weeks", it should be "one week". Okay? So I know this is a simple pronunciation rule, but it's something that it's very important to be careful with. So even if you have to practice at home: "One year, one year, one year. Two years, two years, two years." Keep repeating it until it becomes easy and you don't make that mistake. Okay. they'll hear the sum they have to pay incorrectly or they'll say something costs "Thirty (30)" when it really costs "Thirteen (13)" and vice versa. Same with when you give out your phone number, this could be a real problem -- or your address. So how do I pronounce "thirteen (13)" versus "thirty (30)"? Well the easiest thing to do -- and this goes for all the teen numbers so 13, 14, 15, 16, 17, 18, 19, it also goes for 30, 40, 50, 60, 70, 80, 90 -- it's important to be aware of stress. So what do I mean by stress? Well, when we stress something, we say it louder and longer. So when you say the number "thirteen", the stress should be on "teen". So I should say: "thir-TEEN." It's very clear if I say "teen" longer and louder. Same with "sevenTEEN", longer and louder. So the stress, again, is on "teen", that's what you say louder and longer.